Important New Paper on the Nocturnal Boundary Layer, Mixing, and Radiative Forcing as it applies to GHCN weather stations | Watts Up With That? From Dr. Roger Pielke Sr. comes word of an important new paper that shows how the air near the ground (boundary layer) is highly affected by sensitive nighttime dynamics, which show up in the Tmin of weather station data (GHCN stations in this case) but are not captured by climate models. The paper also showed that the stable nocturnal boundary layer was very sensitive to the turbulent parameterization and surface characteristics such as roughness, and land surface heat capacity and conductivity. That (bold mine) is the sorts of heat sinks/siting issues pointed out in the surfacestations project which showed that 90% of the stations in the USHCN (many of which are also part of GHCN) don’t meet siting specifications (NOAA’s 100 foot rule for example) and have been compromised by urbanization. There will be more coming on this issue in the future. The authors also found that mixing of air aloft was the biggest contributor to nightime warming, and this may be due to surface roughness causing increased turbulence, and thus vertical mixing. I’ve added this graphic to give you an idea of how this works. A weather station downwind of the city, even in rural areas, would get more mixed air that is a composite of naturally striated warmer air aloft as well as air that was warmed from the heat sink effect of the city releasing LWIR at night into the boundary layer. An example of boundary layer mixing of warmer air aloft caused by increased surface roughness (cityscape) and abetted by UHI Long Wave Radiation at night. Image by A. Watts, adapted from MIT’s Velocity Profiles and Turbulence Open Courseware, 2002. – Click for details. The paper addresses the diurnal asymmetry in warming that has occurred in the observed temperature trends in the last century in which minimum temperatures have warmed at a substantially greater rate than maximum temperatures. While the paper goes into considerable detail on the response of the stable boundary layer to radiative forcing that perhaps only a stable boundary layer junkie can appreciate, the implications of the paper ,I believe, are critical to interpreting both the historical temperature data set and global modeling over the last century. For those who do not want to be overwhelmed with details, I believe the introduction and conclusions are tractable for non-boundary layer specialists. Here let me summarize and at the end editorialize on the key points of the paper. In the last century minimum temperatures have warmed nearly three times more than maximum temperatures as captured by the NOAA Global Historical Climate Network. In fact this asymmetry is one of the most significant signals in the climate record and has been the subject of many papers. Our paper shows that the CMIP3 climate models only capture about 20% of this trend difference. This is consistent with other studies. Because climate models have not captured this asymmetry, many investigators have looked to forcing or processes that models have not included such as jet contrails, cloud trends, aerosols, and land use change to explain the lack of fidelity of models. However, our paper takes an alternative approach that explores the role of nonlinear dynamics of the stable nocturnal boundary layer that may provide a general explanation of the asymmetry. This was first postulated in a nonlinear analysis of a simple two layer model we carried out a few years ago (Walters et al. 2007) that indicated that slight changes in incoming longwave radiation from greenhouse gases might result in large changes in the near surface temperature as the boundary is destabilized slightly due to the added downward radiation. This produced a mixing of warmer temperatures from aloft to the surface as the turbulent mixing was enhanced just as an increase in wind speed can destabilize the nighttime boundary and mix warm air from aloft to the surface. Most of the warming at shelter height was due to the warm air mixed from aloft. This is illustrated in figure 10 in the paper. Thus, this process is a highly sensitive positive feedback to surface warming. 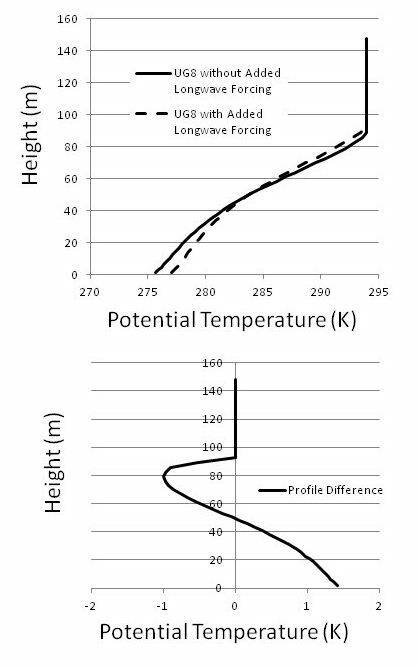 Figure 10: (top) Expanded view of the difference in potential temperature profile between the case of added GHG energy and base case for a geostrophic wind of 8 m s-1(top). (bottom) Expanded view of profile difference. Between heat island effect from more blacktop, cement and building reflecting and then add the dimension of wind farms sucking cooler air to the lowest strata, what a global warming world we will be living in. Not created by coal plants but by human habitation and green energy. Wow! Interesting. Just submitted a letter to “Earth” magazine related to this very issue. This is a terrific paper: it is a empirically motivated advance in modeling. I would like to have seen some scatterplots of model values vs data for at least some actual column, but maybe we’ll get some of those in the future. I forgot, with the new green wind turbines we get to kill more eagles. It will be easier then for natives applying for eagle feathers for pow wows because there will be MORE dead eagles. Yippee! This is not new. In 2003, a ppaer suggested that 10% of warning downwind of urban centers is a product of UHI. As a Reno, Nevadan, living NW and approx. 400ft higher than the airport weather station, I see significant differences in “official” numbers and my own. (I’ve calibrated my outdoor sensor, btw)..
Daytime temps are within reasonable ranges for mine and the official, but nighttime temps are very often 5 degrees cooler, sometimes more. I get a lot of down-canyon drafts off of Peavine, so that’s taken into consideration. Interesting to note that our very own Mike Alger is one of the few knowledgable weather people here that does not even mention nighttime lows very often, knowing that they’re skewed. Nice to see one in the craft that doesn’t fall for the media push to subscribe us all to AGW. I don’t really see the motivation. We already know that cities are warmer at night, and we camn see why intuitively. This doesn’t need to be used in models. If we’re going to have models (which we shouldn’t anyway!) they should simply be based on good long-term non-urban observations. Basic metrology. When there’s a choice between a measurement that has to be adjusted vs a measurement that doesn’t need adjusting, skip the adjusted one and use the ‘clean’ one. Only use adjusted or inferred measurements when good ones are physically unavailable, as in temperatures on Jupiter. I’ve said it several times before. There was massive urbanisation from 1970’s to 2000’s and until they actually go out and see what the historical changes have taken place ANY WHERE NEAR weather stations, I have suspected that people responsible for doing the calculations have GREATLY UNDERESTIMATED the effect of urban warming on the so-called global average land temperature. If we remove all the “adjustments”, and take proper accounting of urban heat effects, I wonder if there has really been that much warming at all !! The problem is that the land temperature calculations, during the 1970’s -2000’s, became much more heavily weighted towards urban and semi-urban weather stations partly because of the massive loss of remote station (why did that happen, anyone know?) and partly because many station would have been slowly influenced by the expanding urban areas. If just raw land based tempertures are used, there is going to be an upward trend in the calculation if correct accounting for these warming effects isn’t made. And with the likes of GISS and CRU actually adjustiung things upwards while cooling the past record, a much larger trend has been manufactured.. just to suit the AGW agenda. So what is the justification for lowering past temperature records? All the flap claiming this decade is the warmest in the U.S. does not add up to reports from the 1930’s. The paper addresses the diurnal asymmetry in warming that has occurred in the observed temperature trends in the last century in which minimum temperatures have warmed at a substantially greater rate than maximum temperatures. Tmin generally occurs in the daytime. Some time after dawn depending on latitude and season (which determine the amount of solar irradiance). And is particularly sensitive to factors that affect early morning insolation (clouds and aerosols). Here in Australia, it correlates poorly with night time temperatures and is not a good proxy. There appears to be an important environment missing from the diagram. That being “airport”. Where you’d need to factor in the effect of the planes moving air around. On the subject of boundary layer mixing, Starting around 1970 in parts of western Europe, including England there were 2 significant land use trends. Removal of hedgerows and installing field drainage. The first would reduce near ground turbulence and hence boundary layer mixing. The second reduce evaporation and hence humidity. A post at Pielke Snr’s website documents how in western Europe humidity has decreased since the 1970s and diurnal temperature range has increased (which decreased turbulence and decreased humidity would contribute to), the opposite to the global average, which has seen DTR decrease and humidity increase. Demonstrating once again that change in a global average isn’t evidence of a global effect. Further to my previous comment (lost?) -not just road traffic, but airport traffic- would prop wash and wing tip vortices stir up the air enough (e.g. early morning departures)? My previous comment was lost by me! This has long been recognised in Australia by the BOM (bless ’em) who show that very minor land form changes (e.g. an earth bank or levee, or longer grass) can affect minimum temperatures. Trees or shrubs growing taller, or even very small buildings, alter air flow. Slightly windier conditions will raise minima. Here in tropical Queensland, a very still, clear night is needed for frost to settle in winter. Very small air movement ill prevent a frost. Has increased road traffic near weather stations been considered? Just another reason not to rely on surface temperatures. Entirely logical but it raises a question in my mind. We know that over the course of the last number of decades, a lot of weather stations have moved from random locations where they were no longer practical for one reason or another to airports. So… are airports more likely to be built upwind of urban centres? Or downwind? I’m guessing that the average pilot (and I’m really guessing here I have no idea) would want the airport upwind of the urban setting to minimize how much turbulence has to be dealt with when landing and taking off. If there is a bias in terms of airport siting that in turn biases the impact implied by this study to the weather stations located at airports, might it imply a bias to the temperature record as a whole? I expect the Tmin rise to slow down at some point, unless Global Cooling sets in. Attempts to measure the height and shape of the Heat Island day and night was going on over 40 years ago. We were measuring the heat island effect of Winnipeg, Manitoba in the late 1960s. We were also attempting to measure the boundary layer but it was limited by the poor instrumentation of the day. We put instruments on high buildings as well as air samplers there and throughout the city for some measure of dispersion. We put instruments every 200 feet up a 1000 foot radio tower right on the edge of the city and discovered the amount of layering and its variation. Others were trying to measure the height of the Heat Island with tethered balloons, helicopters and one study I recall was a tower within the city of Tokyo. We measured and mapped the dispersion effect depending on the various isobaric and measured wind directions and speeds. The downstream impact of an urban area was first identified in the La Porte Indiana anomaly identified by Stanley Changnon. This is why I have always argued that the amount of heat island is a function of the prevailing winds and the location of the weather station relative to the urban area. use a more complete dataset than GHCN adjusted to see that. 2. The paper is nearly silent in its description of how trends for Tmin and Tmax were calculated, how uncertainty was calculated and how the relatively sparse network of GHCN was compared with the spatially complete results of models. 3. I see no links to the code or the data. Show your work or it isnt science. maybe they gave their work to Lonnie Thompson to archive.. or maybe its at the journal.. when folks find it, please provide a link. That said, it is interesting to see the theory about the effect of winds, especially downwind of an urban area. As Oke noted UHI max can be heavily modulated by the regional wind speed and direction. It should be interesting to test these models.. REPLY: “Show your work or it isnt science. maybe they gave their work to Lonnie Thompson to archive…” Mr. Mosher, while I agree, that’s really an unfair comparison, and I’m disappointed in you. Have you asked? No, you haven’t…you want others to find those for you while you bask in snark. Official temp 76 (reported on http://www.intellicast.com/Local/Weather.aspx?location=USCA0967 ). Indoor temp measured in suburbs about 10 mi. from city Center 74. Felt temp outdoors, 5-10 degrees (F) cooler than that. Conclusion, the official temp is actually measuring a mini-climate, the actual temp is far different than that. The official temp is probably from an area surrounded by concrete, like the airport, or from some area surrounded by buildings. The official temp is probably measured at similar micro climate locations across the country and world. The official temp is therefor wrong. Officials measuring that temp get kudos and money if they report warming, so they keep the location where it will report warming. An example of this officialdom effect, the reported increase in autism. When there is any hint that it might be present (like when the child acts up due to the boring drone bureaucrat teacher), the parents want autism to be true because they get money if it is true, and the school also wants it to be true because they also get money, hence the reported increase. Somehow, I don’t think human genes could have changed that much in so short a period of time to create so much more autism, do you? So… are airports more likely to be built upwind of urban centres? Or downwind? Good question. The answer appears (from some google searches) to be neither. Because airport runways are oriented to the prevailing winds, in order to avoid airplanes overflying the nearby city, airports are located at right angles to the prevailing wind. If the prevailing winds are from the west, the airport would generally, be north or south of the city. 1. P=5.67*10^-8*T^4 which is Stefan-Boltzmann Law with P in w/m2 and T in degrees K. So the first issue which makes the discussion less than straight forward is that the amount of P(w/m2) required to raise the temperature 1 degree at Tmin is LESS than the amount of P(w/m2) required to raise the temperature 1 degree at Tmax. 2. The CO2 forcing can only work with the radiance that is provided to it in the first place. Back to SB Law. The amount of radiance emitted at earth surface is a function of SB Law. If less watts are emitted, then there’s less watts to be absorbed and re-radiated by CO2. So…at Tmin, there are less watts than there are at Tmax. Now I’m pretty certain that this doesn’t answer your question. My point is that though the question is simple, the answer is not. Beware the simple answer. The paper is important, but there is nothing new in the boundary layer/turbulence diagram. Discussion, and (less elegant) versions of this appear in publications and studies related to tropical climate design going back to the early 70’s. Noted that Steven Mosher gets a slap on the wrist above, but ” … UHI max can be heavily modulated by the regional wind speed and direction .. ” is certainly correct. We are aware of this here at 19°S 146°E. The knowledge is largely empirical. ” … It should be interesting to test these models … ” could be a problem. Boundary layer wind tunnel tests are expensive to set up, but can produce meaningful results for estimating airflow effects. (Su San Lee, PhD Thesis, Natural Ventilation and Medium Density House Forms in the Tropics, 1998, Institute of Tropical Architecture, James Cook University). Let’s compare the old analog data (+/- a half degree) to todays digital temperatures. Everything still falls in the range of slope! Except for heat island and other man made Unnatural effects. Kill the eagles and save the polar bears. Moshpit is at it again. Clearly he’s a bright bloke but that doesn’t mean he’s always correct. He too, just like ‘scientists’ and ‘intellectuals’ everywhere is suffering from the same sickness as me; hubris! He’s looked at the ‘Best Data’, given it his best shot and come up with ‘.. and this is what it means’ Stats without Science. In comes a new study; it may be right, wrong or irrelevant but it challenges his from-high prognostications. A very human failing that, however understandable, places him squarely within the arena occupied by Mann, Jones et al. Less snark and snipe, Mosh. Just take a lead from SMc and do it without anything to prove other than integrity and an unselfcentred need to be honest! But I’m a know-nothing so easy to swat aside. had to have min 1800ft viz and the jumbos were usually good for 2400 or better..
One point about airports that I don’t recall anyone making is snow removal. When it snows, airports remove all the snow from concrete areas as soon as possible. I recall being at Chicago airport in a snowstorm and watching bulldozers and trucks dump snow into a large hole, and I could see flames coming out of the hole. I assume from gas flames used to melt the snow. Snow has a high albedo and keeps the air above it substantially cooler than concrete. In places where it snows, snow removal will have a significant warming effect on airport temperatures. And increases in the area covered with concrete will introduce a trend. Thinking about night time temperatures, time of measurements, and what may be assumed. A couple years ago I decided to reduce the temperature in my house. It had an asbestose roof and fibro walls. The inside of the house in summer would hit 43deg C.
So for two weeks beforehand I measured temperatures in 3 rooms, the roof, outside and under the house. I found a significantly different temperature profile for each day and in each location. (Most impressive was was 33degC outside and 53degC in the roof). Doing a 24hour temp chart with measurements every half hour; The lowest temperature ouside is steady between 4am and 6am. The sun came up at 6am and the temperature climed steady till 12:30pm. At 2pm the temperature stared an almost linear decline till 7pm, then slowly leveled out and hit bottom at 4am (sun went down at 5:30 [I’m behind a hill]). Just for interest; I installed vents in the roof to see what impact that would have. It delayed the temperature rise in the roof, and it cooled quicker, but made zero impact on the maximum temperature reached inside the roof. Pink bats raised the temperature inside the roof nearly 10 deg C, but reduce the temp in the house 4deg C.
I am currently in rural Montana and it is 100 F at 6:30 pm. We have two banks in town. The larger of the two banks has the thermal sensor hanging on a pipe and the wire runs about 150 feet to the digital reader and posts it at 100. The bank down the block has the sensor mounted in a metal sign and it reads 96 degrees. Why is there a 4 degree differential with two digital thermameters located only 4 blocks apart? How is that for slanting the readings. construction of airports are secondarily based on engineering or technical issues. Primary issues are political!!! Whose land will be bought for how much and where will it be convenient to the people contributing to the politicians making the decisions. Who will benefit from the increase in land values around the airport etc. Philip Bradley you have missed another change in Europe. In 1967, virulent strain of Dutch Elm disease arrived in Britain. More than 25 million trees have died in the UK alone, very few mature elms were left in Britain or much of continental Europe. The English elm, which grew to more than 45 m high,are almost all gone; they died between 1970 and 2000. So, I understand UHI but this paper tells me I must be wary of night temps because of UHI? Well, color me not surprized. So, Steven Mosher, are you trying to say something about Dr. Pielke’s integrity in promoting this study??? That pegged the irony meter so hard that the dang thing busted. I’ll need your address so I can send you the bill for repair and recalibration. I am a non scientist. My observation of this and similar papers is that obtaining meaningful temperature data for the entire earth is probably impossible. Satellites seem to offer a far better approximation of anomolies but ground stations have far too many variables, some I suspect yet to be identified, to be of much use. The best that can be said of the AGW scam is that it has increased research and interest in climate and by doing so has rendered the original hypothesis falsified on many counts. The full paper access link doesn’t work for me, but I see no mention of localized phase changes of water. I would have guessed that freeze/thaw or dew/evapo-transpiration might have a greater effect on the minimum than the maximum. Is this observed in practice, and is humidity data also collected at the weather stations? Tim, having trouble with the link in your post above; it goes to the site but the far right side of the link looks to be ‘malformed’ and results in this error message on the site: “No valid record indentifier specified” … searching for “Stanley Changnon” didn’t seem to yielded four papers and none close to ‘urban heat island’ or related. Steven Mosher-I think the reason the paper doesn’t go into detail about the calculation of the diurnal temperature range trends is because that is not the new work that this paper is doing: diurnal trends are a well tread area of the literature. The majority of the paper-and all the novel work in the paper-is in the particular boundary layer model used to assess the potential for redistribution of heat in the boundary layer as an explanation for the asymmetrical temperature trends in min and max. I’ve seen many references to thermometers in the ground to take soil temperatures, but apart from some brief data i took with a colleague, I have not seen any results tabulated – not that I have looked so hard. This related to the header mention of land surface heat capacity and conductivity. If radiation is going to happen at night, the heat from the day has to get to the surface. How slow is this? While I’m here, might I please go completely OT and ask if anyone has data from thermometers of various types exposed to specific windows in the spectrum, fromUV through vis to near IR to far IR about 100 microns out? Some potentially significant errors could arise if thermomenters were wavelength sensitive. WE know the spectrum reasonably well in terms of absorbance, but I’ve seen next to nothing about how this affects mercury, for example. We know that over the course of the last number of decades, a lot of weather stations have moved from random locations where they were no longer practical for one reason or another to airports. So… are airports more likely to be built upwind of urban centres? Or downwind? It doesn’t really matter whether an airport was originally built upwind or downwind of urban centers. Eventually the urban center encroaches upon and surrounds the airport. Wouldn’t it be more important that airports originally didn’t have paved runways but now have sprawling tarmacs or that they’re now more likely to host jets than propeller planes? In general the inclusion of turbulent mixing and Rayleigh convection would seem to be very enlightened in atmospheric modelling. 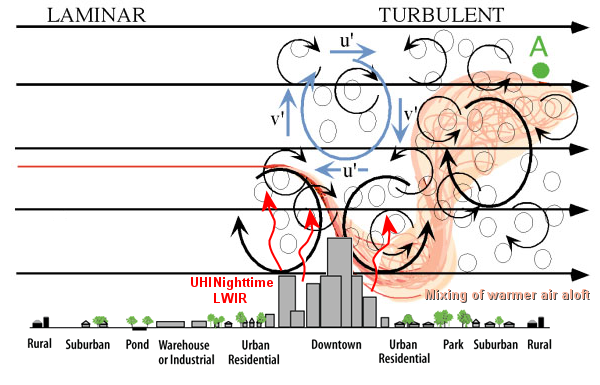 However why would nocturnal LWIR be the major driver of ground level turbulence – would not winds be a greater driver? In consideration of Mosher above, curiosity gets the best of me. I wonder if anyone has filtered out urban data as best it can be, and focused only on rural station data, in its many flavors (T-whatever). Papers, charts etc.? Would this not shed light on a better-mixed thermal anthropogenic atmospheric elixir? Consider wind directions, station geometry to urban centers and downwind stations within given range envelopes developing the long-term radial influence picture for urban density effects. We would need the simply un-messed around with data, wouldn’t we? Does such exist? In juxtaposition to a model, measurement times, readings diurnally vetted for T-min/max, the results might be an indirect measurement of UHI and overall thermal mixing downrange averaged over time and distance. A step further, the stations within a given range of observed historical downrange UHI could be additionally removed such that the data from stations not known to be indicative of modern UHI might represent the well-mixed continental windswept mean. Such a conservative approach would not consider urban growth, opting for present-day urban footprints, further limiting stations that might be used to construct the “rural mean and variance”. If not, Willis, would you be interested? Steven? Or is it just not that simple? It would be nice to know the trends of whatever the uncontaminated but well-mixed natural/anthropogenic means might turn out to be at this point in the probable evolution of the most recent end extreme interglacial. At the best resolutions we continue to prize out of the paleoclimate recordings, climate chaos seems to attend the ends of the extremes. To even tell we were here, now, we must generate a signal clearly discernible over such historic climate noise. Wouldn’t it be more important that airports originally didn’t have paved runways but now have sprawling tarmacs or that they’re now more likely to host jets than propeller planes? I think that’s a given, I was looking for an induced trend over and above that. Philip Bradley burst my bubble though by pointing out (correctly) that airports tend to be located at right angles to the prevailing wind, which I think would result in them being neutral from the perspective of this paper. Abstract of BAMS 1980 paper by Stanley Changnon, Jr. Title: More on the La Porte Anomaly: A Review. Authors: Changnon, Stanley A., Jr.
From a quick read it seems the authors mean well but there are many wrong assumptions and calculations. For a start mentioning GHG forcing would turn off any engineer who understands heat and mass transfer. There are drivers such as temperature difference, pressure differences, concentration differences, applied forces, gravity, etc but a gas such as CO2 can not force anything. They (and I assume all so-called climate scientists) seem not to have heard of natural and forced convection., there is no mention of dimensionless numbers such as the Nusselt No, , Prandtl No or the Schmidt No, (which Gavan Schmidt does not understand). Sure UHI exits, I see it every day and night driving in my SUV which has a outside thermometer. The temperature can rise be as much as 3C within 1 or 2 km driving from rural to an urban centre. However, UHI has nothing to do with so-called greenhouse gases. Dr Roy Spencer has a population adjusted US temperature dataset. He has several posts about it at his site. He uses hourly temperature measurements and avoids the issues present in the Tmin – Tmax data. One thing his data shows (my interpretation, not his) is the Oasis Effect in the US southwest. The Oasis effect is where urban irrigation increases evapotranspiration and decreases temperatures. This effect is particularly large here in Perth where everyone irrigates their garden. Not all urban effects cause warmer temperatures. Heat loss from the surface on clear nights is by direct IR to space. This disruption of the boundary layer as described results in an increase in night time surface temperatures and corresponding reduction of air temperatures. The IR to space is proportional to 4th power of surface temperatures, so this increased surface minima should produce a significant increase in heat loss from the Earth. As we all know, most of the warming over the past century had occurred as raised minima rather than raised maxima. Thus what is being read global warming could in fact be due to increased heat loss from the entire global – i.e. surface warming == global cooling. News flash: downwind of cities, the nights are warmer. File under “The Bleeding Blinding Obvious”. If a butterfly flapping its wings on one side of the planet can cause a hurricane on the other side, just think what a jet engine can do! I think, although it might be bleeding obvious, I would have just assumed that it might be the result of warmer air from the city moving into the rural area. What is described above, again is the bleeding obvious once it’s pointed out to you. I guess the whole thing become complicated by wind strength, atmospheric temperature, physical geography etc. It’d be realy interesting to see a “thermal” map of a region around a city with prevailing wind direction (for each of the four seasons). I was in error on one of my post last evening. At 6:45 pm last evening the differential between the two bank thermometers 4 blocks apart in Hardin, MT was 7 degrees fahrenheit. Take the higher of the two for calculating global warming. Thanks. I’d forgotten about Dutch Elm disease. I initially thought you might be on to something significant. But science is a process of discovering where you are wrong, and discovering you are wrong is more important than thinking you are right. While I appreciate the comments, it seems there is some confusion on our paper, perhaps because Anthony only put part of my blog on his site. I would suggest you go to Roger Pielke’s site to read the full blog. Our paper was not meant as another CO2 contributes to global warming paper – in fact a reviewer said the global warming community would not like our results. It was also not meant to be a paper on the UHI but our results do show the nightime bounadry layer is sensitive to surface parameters . I believe strongly that land use changes have a profound effect on temperatures especially nighttime temps. Rather, our paper was pointing out that even in areas where land use has not impacted temperatures that there is a boundary layer process where added downward radiation (from CO2 or aerosols) can destabilize the boundary layer and produce a redistribution of heat (just as land surface changes do) warming the shelter level temperature. Thus, this process is not about an accumulation of heat (the real essense of global warming theory) but about a warming of a thin layer at the surface 20-50 meters thick due largely to a redistribution of heat in the nocturnal boundary layer. The asymmetry in warming of Tmin by this process (and land use) and the lack of GCM’s to replicate this Tmin warming (and land use Tmin warming) means that when models match the global Tmean (which is what modelers claim as proof of model fidelity) but not Tmin then they are warming Tmax too much. Because Tmax is tied to a deeper boundary layer it means that they are likely warming a much deeper layer than the thin warming in observed Tmin. Water vapor feedbacks require a deep warming. I think our paper indicates that observed temperatures are only showing a shallow warming, so models are likely overstating the deep troposphere warming (which is consistent with the Christy-Spencer satellite and model discrepancy). Because models are over-warming a deeper layer, water vapor feedbacks are likely being overstated. I think this is consistent with Roy Spencer’s hypothesis that models are too sensitive to feedbacks. No Mosher delusionally believes he is more objective than everyone else – the one true rational one, the independent thinker, the moderate or whatever. It gets old fast. Spot on Poptech. Mosher is too much in love wit himself and his own perception of his knowledge. He as long ceased to be an objective arbitrator on anything related to temperature records and models. He reacts exactly like what the AGW crowd do to any paper which challenges their position, which is by irrationally striking out aggressively and foolishly. Welcome! We’re always glad when a paper’s authors stop by. I would suggest you go to Roger Pielke’s site to read the full blog. Thus, it may be better for current climate models, when they test replication of past climates and to project future global warming, to only use maximum temperatures rather than the current metric of using the mean daily temperature, which contains the minimum temperature. I live in a residential area, sort of in a river valley, and it doesn’t take long to realize just how unrepresentative nighttime near ground temperatures are of, well, much of anything other than heating bills. I was in a weather mail list where one of the contributors often reported his “garden” temperature a few inches above ground, and often several degrees cooler than is “real” setting. If there’s any wind at all, we have little cooling, even a little gust in the middle of the night can scour out the inversion. In the summer I can see temperature fall to the dew point, then decline with a longer time constant as dew formation retards cooling. On really cold nights, I can see the temperature hit the dew point and barely slow down because the absolute humidity is so low. Averaging Tmax and Tmin is like averaging apples and oranges, (whatever that means). During the day temperature climbs starting at dawn, but when the inversion warms up, then convection and mixing with the entire air column slows further warming way down because now the whole air column needs to be warmed. This shows up well at Mt Washington. The weather observatory on top is always in air flow and there’s very little nighttime drop. Their temperature plus 30°F (for adiabatic expansion) is often a good prediction of what my Tmax will be that day. Of course, changes in night-time temperatures represent real changes and possible impacts to the climate system (e.g., melting ice), to society (agricultural productivity) and to ecosystems. Tmin is certainly important, both for human impact and surface radiation. For climate modeling, it’s mostly another confounding variable. That’s one reason I like the satellite record. http://home.comcast.net/~ewerme/wx/current.htm – look at the amazingly flat top of today’s temperature curve. http://vortex.plymouth.edu/mwn24.gif – Note Washington’s temperature today was 62-63°F, mine was 88-92°F, just about 30°F warmer. The answer appears (from some google searches) to be neither. Because airport runways are oriented to the prevailing winds, in order to avoid airplanes overflying the nearby city, airports are located at right angles to the prevailing wind. If the prevailing winds are from the west, the airport would generally, be north or south of the city. Not always the case. e.g. LHR/EGLL is west of London with east/west runways. It also isn’t uncommon for cities to expand to surround airports which serve them. Factors such as where the cheap land was when the airport was built may also be relevent. vertical mixing at airports? Since the post suggests that low mixing is causing artificially high TMin readings, isn’t it a good thing to bust up the boundary layer at night around the weather stations?